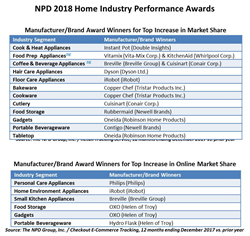 The NPD Group’s home division presented its fifth annual industry performance awards during the International Home + Housewares Show, on Saturday, March 10, 2018. Our industry is being revitalized, even revolutionized, by the innovative approaches many in our industry have employed in a very short period of time, and we’re excited for the successes on the horizon," said Lora Morsovillo, president of NPD’s U.S. Home practice. The NPD Group’s home division presented its fifth annual industry performance awards during the International Home + Housewares Show, on Saturday, March 10, 2018. 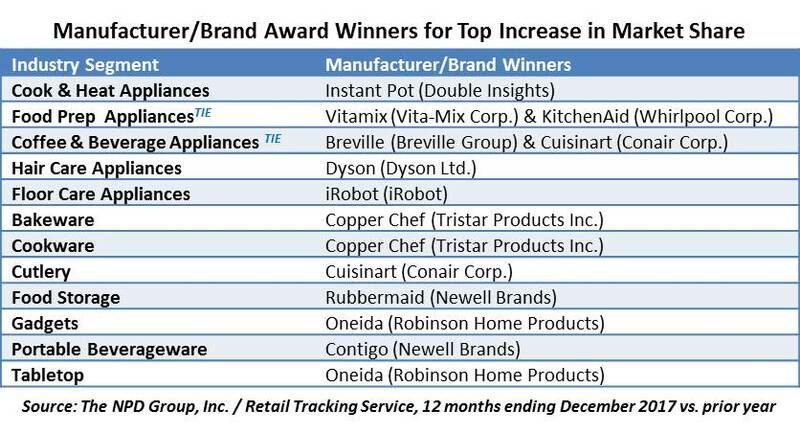 Awards were given to small appliance and housewares (non-electrics) brands with the largest increase in U.S. market share in 2017, compared to 2016, according to dollar sales from NPD’s Retail Tracking Service (brands with overall sales among the top 10 in the category were eligible). In recognition of the importance of e-commerce, this year’s event included six new awards presented to top online performers across the three main small appliance segments, and some of the hot housewares categories. These new awards feature U.S. e-commerce insight from NPD’s Checkout service, based on information collected from more than three million consumers through data provided by our partner Slice Intelligence.